The longstanding collaboration between director Edgar Wright and actors Nick Frost and Simon Pegg continues with 'The World End' - the concluding part of their "Three Flavours Cornetto"/"Blood and ice cream" trilogy, following 'Shaun Of The Dead' and 'Hot Fuzz'. Largely abandoning the genre pastiche approach of the previous films but retaining the male bonding aspects, 'The World's End' delivers a rip-roaring comedy, with a sci-fi tinge. 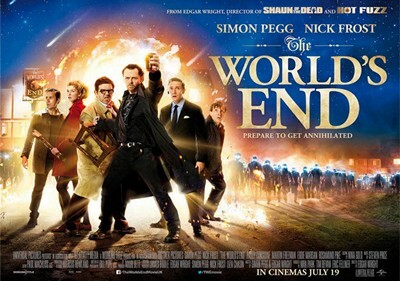 Twenty years after failing to complete a pub crawl in their quintessentially English local town of Newton Haven, five childhood friends reunite at the behest of their former "leader" (Simon Pegg) to give it another shot - this time hoping to actually make it to The World's End as well as repairing friendships along the way. All is not as it seems in the quiet town however, and the friends find themselves in a battle to survive, let alone finish off their hallowed pub crawl. While 'Shaun Of The Dead' gleefully paid homage to zombie movies and 'Hot Fuzz' successfully parodied the action genre, 'The World's End' effectively treads its own path. In doing so, it frees itself to play upon the strengths of its main players - Edgar Wright delivers a supremely comedic editing and directorial style, with Pegg and Frost back to trading witty quips just like the old days of 'Spaced'. The film is far from simply a comedy, although it is quite probably the most hilarious offering from any of its cast members - particularly Paddy Considine and Eddie Marsan, who usually find themselves in more hard-hitting efforts. Wright also brings forth his capable action direction, most recently seen in 'Scott Pilgrim Vs The World', with some excellently choreographed hand-to-hand fight sequences. The razor sharp script from Pegg and Wright is the star of 'The World's End' - we're talking five blades, not three - but Pegg himself delivers arguably the finest acting performance of his career. His character's arc terrifically mixes misplaced bravado, selfishness, desperation, and stupidity, in a surprisingly sympathetic manner - albeit perhaps at the expense of the likes of Martin Freeman and Rosamund Pike in their bit-part roles. The science fiction element of 'The World's End' only appears in its latter half, and in some respects, the film suffers somewhat - certainly, the final confrontation falls a little flat. 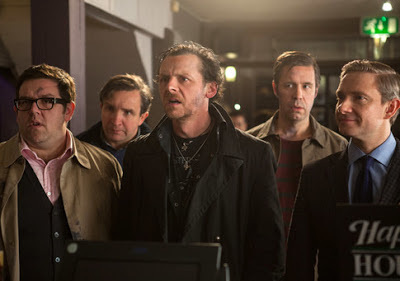 However, with the film delivering such a great number of belly-aching laughs and enjoyable cameos, as well as a fantastic Madchester-infused soundtrack, it is difficult to do anything other than heartily recommend 'The World's End'. A fitting end, in fact, to the trilogy. 'The World's End' is out in UK cinemas on 19 July, through Universal.